For my own reference in future, I have decided to note down what I can remember of the overall sequence of events surrounding the farrowing for both Sissy and Esther. Looking back now it’s a little bit of a blur mostly because it was our (and the sows) first time for farrowing. I can imagine I’ll forget something crucial which would be helpful for the next time so it’s good to have this noted somewhere. Despite having a good plan in place in advance, the reality was that there were minor differences between each of the pigs which were dictated by the circumstances at that time. This was not entirely unexpected as many of the books and information about farrowing contradict each other to a certain extent which makes it hard for first-timers like us. About 1 week ahead of time we prepared the shed and moved both sows indoors together so they could keep each other company. We decided to farrow them inside as being nearer the house would make the job more manageable for us and besides the weather was too cold to leave everything to nature outside. Set aside all the bits and pieces in readiness for farrowing – iodine spray, cloths/towels, bucket for warm water etc. 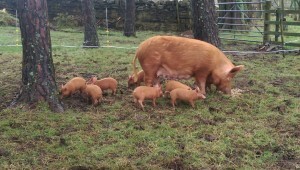 We were on-hand for the first farrowing (Sissy) between 5pm and 11pm on Thurs 25 Feb with only 5 born and all survived. The first piglet arrived a little unexpectedly so we had to hurriedly move the other sow (Esther) back out to the woods so that Sissy could have the shed to herself. Second farrowing (Esther) eventually happened in the early hours of Mon 18 Mar with 8 surviving out of 10 born when we checked at about 7am. That includes one piglet which needed some intensive care at the beginning and at one point we almost gave up on it but he had rallied around a couple of hours later and is now indistinguishable from the others. By the end of the first week they are getting much more inquisitive and exploring the shed until a human appeared then they’d scuttle back to the heat lamp corner. By 3 weeks they should be getting at least some hard feed as mothers milk production will peak around that point and then starts to reduce over time. It was always planned to move each little back to a prepared pen in the woods, partly to clear the farrowing shed in time for the second farrowing but also so that the piglets get used to electric fencing at an early age. If necessary we could move the piglets back into the shed in preparation for selling them once they are ready to go. We moved Sissy and her litter by leading her first and returning to carry each piglet in turn (with 2 people). 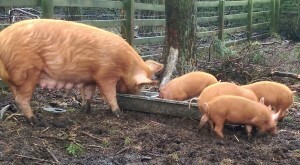 The piglets were between 2 and 3 weeks old so carrying was the safest and quickest option. We moved Esther and her litter by herding all of them together (with 3 people) because the piglets were a couple of days over 3 weeks old (due to other commitments elsewhere). Initially a creep fender was used in the woods to try to contain the piglets until they were used to their new surroundings which worked well for Sissy’s litter for a couple of days. Unfortunately Esther’s litter were that little bit bigger and had jumped the fender within an hour or two on their first afternoon in the woods so it was removed completely in the end. Once they are all in the woods, the only problem we found was that we needed more buckets as the each group had differing quantities of feed plus each group had a ration of sow rolls for the mother and also another ration of smaller pellets for the piglets. Keeping each to their own feed was eventually only partially successful but so long as everybody ate something I was happy!